My answer on the issue is featured in the post. It is a great blog – I definitely recommend checking it out on a regular basis. We are also in the Sunday Oregonian column entitled: “Act Now to Save on 2009 Tax Bill”. See the small business section for some planning tips. I will be featuring more year-end planning ideas on this blog over the next few days. Oregon Income Tax Increases – Sales Tax in Disguise? Recent articles in The Oregonian laid accolades on the Oregon legislature for all they have done for us during this last session–really important things like banning puppy mills, making it illegal to “top off gas tanks when filling,” requiring calorie counts on chain restaurant menus, and raising the cost of higher education, which, by the way, has increased tenfold in the last 15 years. Don’t get me wrong, I have always been against the way pet stores have bred the poor puppies in rotten conditions, but I take exception to giving accolades to our government officials during a time of economic stress for spending so much time on trivial pursuits and for not delving into the real reasons behind our budget problems. I won’t elaborate on the fact that raising taxes historically has produced less income to the government than when tax rates were lowered. The fact is when more income is generated, more tax is paid. When the incentive and ability to make money are lowered by raising taxes, less revenue is generated. Instead I will explain with an actual example how the changes this legislature made during this economy will, in fact, make many businesses think harder about closing their doors and relocating across the river. I will also point out that many businesses this year with between two and twenty million dollars in sales will possibly have losses, not income. I will of course acknowledge that my view is somewhat skewed to an observation of only the 120 corporate clients I have firsthand experience with, but this is most likely a reasonable sample of small business in Oregon. Currently in Oregon, all business entities established as C-corporations filing federal Form 1120, or set up as pass-thru entities such as multi-member LLCs filing federal Form 1065, and S-Corporations filing federal Form 1120S pay a minimum tax of $10 per year. If the entity was a C-corporation, it would pay tax on its net taxable income at 6.6% but not less than $10, whereas the pass-thru entities only pay the $10, as their net taxable income is “passed through to the individual owners,” and the owners ADD it to their personal income tax returns and pay personal taxes on the combined amount. Effective for tax years beginning on or after January 1, 2009, the minimum tax on pass-thru entities goes to $150; however, for taxable C-corporation entities, the minimum tax will be based on the gross Oregon sales, regardless if the corporation has a net taxable income or not. I have long felt the $10 minimum was way too low. It takes much more than $10 to administrate the filing of these returns. I even feel that $150 is low. California, which has one of the nation’s highest minimums, is $800. However, to base the minimum on gross sales for a taxable C-corporation entity is nothing more than a disguised attempt to charge the entities a sales tax. What the legislature and our governor do not understand is that small businesses provide much more in terms of long-term revenue to our State, regardless of whether they end up with a net taxable income. Let me give you the following example from an actual business that has operated in this state since 1971, employing between 50 and 100 people per year. This company has an average of $19 million in sales per year and averages 60 employees, so the payroll is an average of $3.2 million per year. The company is a wholesale operation and purchases $12 million worth of products per year. The company provides health insurance and retirement benefits to its employees. It also pays rent to another Oregonian for $350,000. Sometimes we believe that the owner is taking a majority of the $3.2 million in wages. However, in this example, the owner averages $200,000 or less. Now here is the kicker: Because this company is generous to its work force, hiring, paying health insurance, retirement, and other expenses, its average annual net income is less than $200,000. And due to economic conditions, last year and this coming year, it will actually have zero net income. Here is the problem with the current change to the C-corporation minimum tax: This corporation, and many others like it, will provide jobs to Oregonians, will provide health insurance to Oregonians, will provide revenue to other entities from purchasing products, both in Oregon and across the country, will provide revenue to another entity for rent, will provide retirement to people who might not otherwise save, and for its efforts will pay Oregon $7,500 in minimum tax. In addition, Oregon will pick up revenue from the $3.2 million in wages, both in employment-related taxes and income taxes from those individuals, and from the $350,000 in rent. If you do the math, here is how it looks: When the corporation makes a net of $113,636, it would pay 6.6%, or $7,500. But if it has a loss of, say, $100,000 and makes nothing, it would still pay $7,500. Now, let’s examine this same company if it were a pass-thru entity meaning, again, that the net income or loss would be added to the individual’s return and taxed with the personal income. Let us further assume the owner received a salary of $200,000, owned a home with a mortgage and property taxes and, being generous, gave to various charities so that the owner had itemized deductions of $35,000, including a state income tax of $10,000. His state tax under these conditions would be approximately $15,000. Now, if the company had a loss of $100,000, which will be likely during these economic times, his Oregon tax, which would include the company, would go down to $6,000, plus the company’s minimum Oregon tax on a pass-thru entity of $150. Here is the comparison: Nothing else in the company is different other than whether it is a pass-thru entity or a C-corp. The owner’s salary is the same, the company expenses and operations are the same. But in one case, the loss saves the taxpayer $9,000 in Oregon taxes, and in the other case, because it is a C-Corporation, not only does the individual still pay $15,000 but the corporation is out another $7,350, for a total difference of $16,350. Even if there isn’t a loss and the company just breaks even, the difference is the minimum tax of $7,350. All this is only because of the type of entity the business chose years ago. I do not believe the Oregon legislature understands the tax system, or they are more concerned with just showing they did something rather than developing a well thought out change that does not penalize the only source of revenue that they need to correct their budget problems. That source is the working America. In our previous post, we discussed the Oregon business tax increases resulting from House Bill 3405, which passed the Oregon Senate last Thursday. Coupled with HB3405 is the sister bill regarding individual tax increases – House Bill 2649. This bill is also headed for Governor Kulongoski, who has already made a statement of support for the bill, so now is the time to start looking at the details and adjusting your estimated tax payments if needed. For tax years beginning on or after January 1, 2012, the 10.8% rate is reduced to 9.9% for excess taxable income over $125k but under $250k; however, the 11% rate for excess taxable income over $250k remains the same. The tax rate on taxable income under $125k remains unchanged at 9%, so we are just talking about the income above $125k here. For a more detailed breakdown of the rates at different income levels, see page 2 of HB2649. Single/MFS – phase-out starts at $125k with complete phase-0ut at $145k. MFJ – phase-out starts at $250k with complete phase-0ut at $290k. Oregon will exempt the first $2,400 of unemployment income received. They will not charge penalty and interest to taxpayers that underpay as a result of the tax increases (how gracious of them). I am sure they will be releasing more detailed information after the Governor signs this into law, but hopefully this helps give you an basic understanding of the new changes. 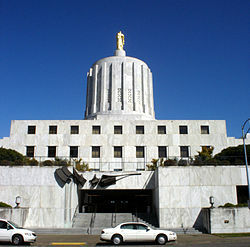 To get an idea of the impact of the tax increase, review these 2006 Oregon tax statistics. If you will be affected by these tax increases, be sure to call your CPA or tax professional as you may want to revise your remaining Oregon estimated tax payments for 2009 – or at least get an estimate of the additional tax that will be due. As many of you may already know, there was a bit of drama last Wednesday in the Oregon Senate when House Bill 3405, which increases taxes on corporations and businesses in Oregon, was derailed by just one vote. However, Thursday the vote changed and bill passed the Senate, and now it is on its way to Governor Kulongoski, who has already made a statement about it leaving no doubt that we need to start preparing the changes. The low $10 minimum tax for filing business entities (not including disregarded entities) has been increased to $150 for tax years beginning on or after January 1, 2009. For C-Corporations, the minimum tax of $150 only applies to corporations with Oregon sales less than $500k. C-Corporation with Oregon sales over $500k will now pay a minimum tax based on a multi-tiered calculation based on the level of sales. In addition, the tax rate for C-Corporations increases from 6.6% (current rate) to 7.9% for taxable income in excess of $250k. In addition to tax increases, HB3405 will double most business registration filing fees with the Oregon Secretary of State from $50 to $100. Some filing fees, like those for authority to transact business in the state, will increase to $275. Most copy and certificate fees will also increase at the Secretary of State’s office. In addition, the notary public fees will increase from $20 to $40. All in all, the increases are not a surprise for most of us. The Oregon excise tax has been much lower than similar taxes in most states, and there was talk before the recession about increasing the tax to $50. However, for the small business owner in Portland, this is not the best news – especially after the Multnomah County minimum tax increase for 2008. For those of you with C-Corporations, you may want to talk with your CPA regarding the cost to convert to an S-Corporation. For many, the large amount of built-in gains tax would not make the conversion worthwhile, but with this tax increase and the likely upcoming expiration of qualified dividends and low capital gains rates, it is definitely worth looking into as some could see long-term tax savings. Tis’ the season for making your final charitable contributions for the year and helping out your community at the same time. If you are going to make only one contribution this year, I would highly suggest contributing to Oregon’s Individual Development Account (IDA) Initiative. finally you have to claim an other addition labeled “715” on your Oregon return as you cannot claim a deduction for an item you are using for a credit. the other addition to Oregon income would be $100 ($75 credit divided by 75%). Even with the other addition to income, the IDA contribution is a great deal! However, make sure you will have Oregon tax liability, as in certain cases the credit would not be beneficial. The best part is that I just emailed Cynthia Winter, the IDA Program Director, and the credits are still available at this point.